Color Guard: Blue Devils (14.8), June 22, Clovis, CA Open Class: Brass: Vanguard Cadets (13.9), June 23, Stanford, CA Percussion: Blue Devils B (13.5), June 22, Clovis, CA Color Guard: Blue Devils B (13.4), June 22, Clovis, CA View all scores and recaps. Storylines to watch • In a season that so far has pointed to lower scores across the board compared to 2011, the Blue Devils have been the only of DCI's World Class corps to date other than the Cadets to score above 70 points in their first contest of the season. 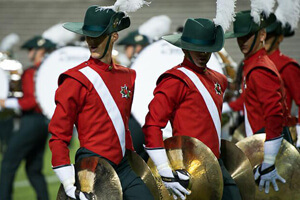 BD's score of 73.70 on June 22 in Clovis, Calif., is the corps' lowest season-opening score in 12 years when the corps scored 73.55 on June 17, 2000 in Concord, Calif. It's been nearly 20 years since the Blue Devils have scored less than 70 points in their first contest of the season. • Of the World Class corps who have competed to date, the Blue Devils are the only currently on the Tour with a chance to pull off an undefeated season in 2012. • As of this week, Carolina Crown is the only corps to have passed the 75-point mark. Bluecoats are on the cusp of that scoring milestone, earning a 74.10 on June 23 in Woodbury, Minn., which was a big jump in score having earned a 71.00 one day earlier in Madison. 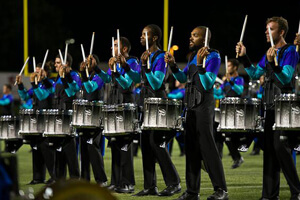 The next time Carolina Crown and the Bluecoats will meet is June 30 in Michigan City, Ind. • It took four shows to do so, but the Cavaliers finally eclipsed the 70-point mark on June 21 in Dothan, Ala. scoring 70.55. The corps would drop back below 70 two days later in Orlando finishing at 69.80. • Open Class corps made their debut on Friday, June 22. 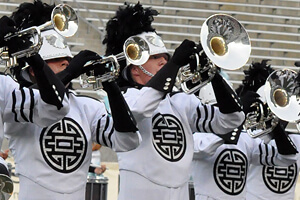 While the Colt Cadets performed in Madison, Wis., Blue Devils B and Vanguard Cadets went head-to-head in Clovis, Calif. Blue Devils B, the top Open Class corps at the contest, placed 2.15 points ahead of the second place Vanguard Cadets. Nothing unusual for either corps, as this is the fourth year Blue Devils B has taken top Open Class honors in Clovis, placing 2.3 points ahead of Vanguard Cadets in 2011, 2.5 points in 2010, and 3.2 points in 2009. 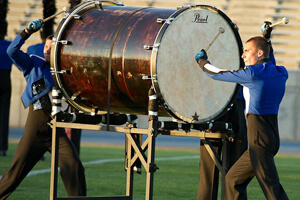 • The Cadets continue to narrow the gap in scores between themselves and Carolina Crown. 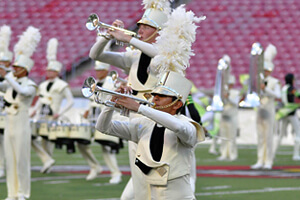 After finishing 1.8 points behind Crown in Dothan, Ala. on June 21, the Cadets came within 0.30 of sharing the top spot with Crown in Orlando on June 22. It hasn't been since the first event of the 2012 season in Akron, Ohio that the Cadets have finished ahead of Crown.